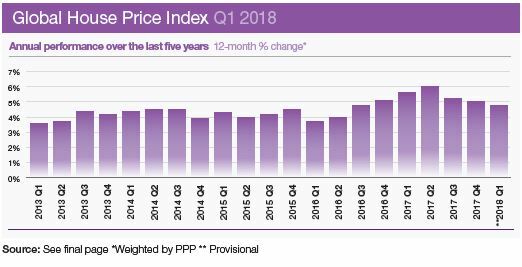 Hong Kong leads our Global House Price Index rankings for the first time since the second quarter of 2015 with average prices ending the 12 months to March, 14.9% higher. Since our index was first published in 2008, Hong Kong has held the top spot on ten different occasions – more than any other territory tracked. Despite an improving supply scenario over the long-term – 96,000 apartments are due to be released in the next three to four years – and the likelihood of a prime rate rise, prices in Hong Kong continue to accelerate with small to medium-sized units recording the strongest price growth. The Mediterranean island of Malta occupies second spot (13.6%) in our rankings, while Iceland (13.2%), Ireland (12.7%) and Jersey (12.1%) complete the top five. Supply constraints alongside strengthening demand are together putting pressure on prices in both Malta and Jersey. In Ireland’s case, its burgeoning economy explains its strong performance. Ireland has been Europe’s fastest-growing economy for four consecutive years, with GDP growth estimated to have reached 7.8% in 2017. Despite rising by 12.7% in the year to March, residential prices in Ireland remain 21% below their peak in Q1 2007. As we indicated in our last edition, Europe’s recovery is now well-underway, closer analysis confirms 11 of the 15 strongest-performing housing markets globally were in Europe at the end of March 2018. 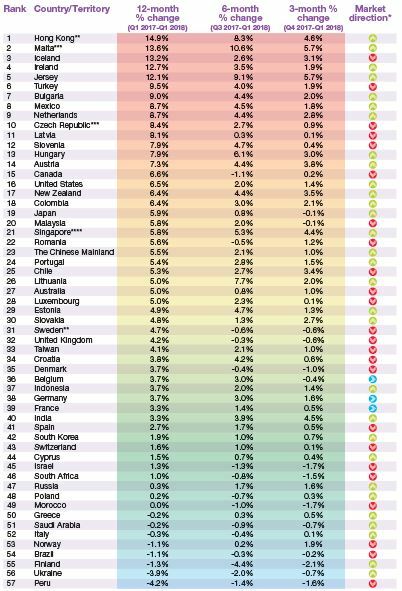 But it’s not a uniform picture; Greece (-0.2%), Italy (-0.3%), Norway (-1.1%) and Finland (-1.3%) all sit within the bottom ten rankings. What is clear is the extent to which the outliers are disappearing with the performance of countries and territories now converging. A year ago 18% of markets recorded annual price growth above 10%, in Q1 2018 this figure has fallen to 9% (figure 3). This may be an indication that buyer sentiment is weakening, as the shift towards tighter monetary policy and the removal of stimulus becomes a reality in key global economies. Ahead of the G7 summit, we assess average price change for each member state and the rise in base points since the last G7 summit a year ago (figure 4). Canada and the US, the two markets that have registered the strongest rise in prices, have also seen their base rate rise by 0.75 basis points over this time. Analysis by world region shows North America (6.6%) remains on top (based on a simple non-weighted average), second is Asia Pacific (5.7%) but now hot on its heels is Europe (5.3%) with the Middle East (3.5%), Latin America (3%), Africa (0.5%) also recording positive growth, only Russia and the CIS (-1.8%) saw prices decline on a regional basis. Data for Australia, Belgium, Cyprus, Czech Republic, Denmark, Estonia, Finland, France, Germany, Greece, India, Israel, Italy, Japan, Latvia, Malaysia, Morocco, New Zealand, Peru, Poland, Romania is to Q4 2017; data for Bulgaria, Croatia, Hungary, Luxembourg and Slovenia is to Q3 2017. The Knight Frank Global House Price Index established in 2006 allows investors and developers to monitor and compare the performance of mainstream residential markets around the world. The index is compiled on a quarterly basis using official government statistics or central bank data where available. The index’s overall performance is weighted by GDP on a Purchasing Power Parity basis and the latest quarter’s data is provisional pending the release of all the countries’ results.